recently i participated in a wikipedia edit-a-thon. this was part of the Art+Feminism project, which aims to improve the representation of women artists on wikipedia. it was the first time such an event had been organised in munich, and there was a very good turn-out, with about 20 participants and 4-5 people from Wikipedia Mŭnchen. i have been a small-time wikipedia editor since 2008, when i discovered that someone unknown to me had created an article for cyberformance, which had then been flagged for deletion due to not being important or verified enough. this was quite a bruising introduction to the world of wikipedia editing. it’s one thing to make text edits on an article, and quite another to navigate the circular paths of guidelines and pedantic admin users. it seemed that the fundamental strategy of wikipedia admins is to drive new editors to frustration, breakdown even, so that we eventually simply give up on trying to correct whatever article has been slated for deletion. i am pretty persistent, but i was nearly at my wit’s end trying to meet the complex requirements. it took hours of my time and left me feeling exhausted, disrespected and as if i was trying to perpetrate a crime against knowledge. i had a similar experience a few years later, when someone, again unknown to me, created an article about me as a student project; apparently their class was given an assignment to create a wikipedia article about an artist they admired, and this student chose me. naturally, the student subsequently forgot about this assignment and never maintained the article once it was created (i wonder if the teacher proposing this assignment included the need to remain responsible for their articles FOREVER …); probably they forgot how to access their wikipedia account, and no longer have the university email address that they used for it. so the admired artists’ articles languished, incomplete and out of date. when, purely wishing to set the record straight, i edited it, the problems began. like sharks attracted by the blood of a wounded fish, wikipedia editors with nothing better to do delight in slapping notifications on such pages; not enough verifiable sources! someone close to the subject is a major contributor! or, most demeaning, this person is NOT NOTABLE ENOUGH! who decides when someone is “notable enough” or not? and notable to whom? wikipedia prides itself on being “neutral”, on sticking to facts and written in a neutral tone; the project “strive[s] for articles that document and explain major points of view, giving due weight with respect to their prominence in an impartial tone.” but – “major points of view” from whose perspective??? when you click on the “major points of view” link, it brings you to an article about “neutral point of view“, which is something entirely different. a “neutral” point of view is one that sticks to simple verifiable facts, without expressing an opinion, whereas a “major” point of view is presumably one that is shared by a majority. that doesn’t mean it’s neutral – in fact more often than not it is anything but neutral. since wikipedia was initiated by well-resourced white men living in the developed world, it is inherently biased to the point of view of privileged white men. it’s no wonder that women are underrepresented, since we have long been underrepresented in patriarchal history and are still so in the contemporary patriarchial world. the “major points of view” that are documented and explained on wikipedia are predominantly the points of view of privileged white men. Their “neutral” is not the same as mine, which is not the same as billions of people in different parts of the world. 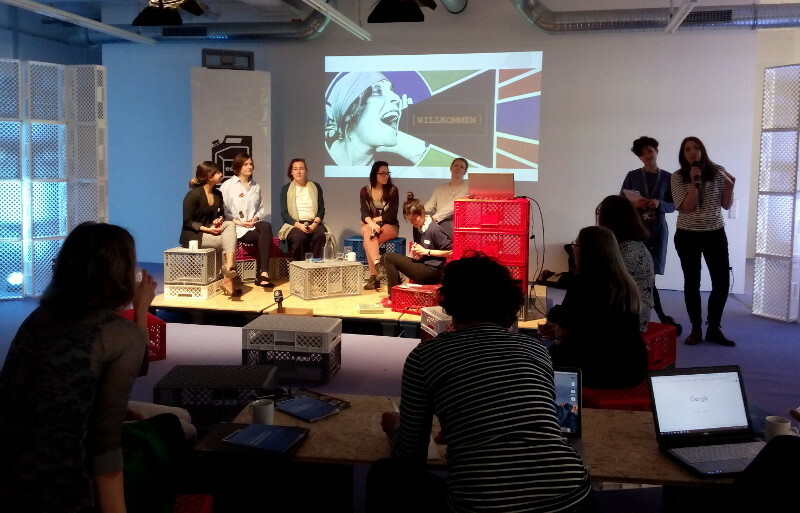 the munich edit-a-thon had begun with a lengthy panel discussion featuring a selection of interesting women invited to give their opinions about why women are underrepresented on wikipedia – which struck me as being rather a waste of time. we were there because we already knew this to be a fact, and wanted to change it, not talk about it; the “why” is obvious – we live in a patriarchy and wikipedia is a part of that too. no need to discuss it anymore, let’s get on with changing it! most of the other participants at the edit-a-thon had never edited a wikipedia article before and didn’t have log-ins. while they were logging in and learning the basics, i and a few others got stuck in to editing. i created a page for the digital artist and researcher Gretta Louw, and after a couple of hours work i published it – only to be immediately slapped with a copyright violation. it hadn’t occurred to me that using slightly altered text from Louw’s own artistic statement would constitute a violation of copyright; however as the text was on the web (on her own website), the copyright-checking bot found it immediately, and deemed my slight editing of it insufficient. never mind that the artist had herself given me permission to use it! so, i deleted the offending text and followed the necessary protocol and the copyright violation was removed – to be replaced almost immediately with demands for more citations. how many citations do you need? wikipedia has “no rules”, just guidelines. so, if you are a living woman artist, it would appear that 15 citations (of which six are the artist’s own website or publications, and nine are from third party sources) is not enough. if you’re a living male artist, on the other hand, a single reference will suffice (here’s one example – at the time of writing with just one reference – no reflection or judgement on the artist himself). another participant at the edit-a-thon offered to help bring the article about me up to standard, and she made quite a bit of progress, but the tags haven’t yet been removed. meanwhile others were also discovering that their work was attracting criticisms. it’s somewhat ironic that wikipedia has a page in its guidelines titled “Please do not bite the newcomers“, encouraging experienced wikipedians to be gentle with newcomers and assume that they are in good faith. the article warns that nothing scares newcomers away faster than hostility. yet several of us left the wikipedia edit-a-thon feeling deeply frustrated, having voluntarily contributed hours of our time and energy only to have it thrown back at us, be told it’s not good enough, and expected to devote even more time to improving it. and yet: wikipedia exists, our information is there, and if we don’t participate we can’t complain about underrepresentation or incorrect/poor information. the edit-a-thons are raising awareness, bringing more women into the project, and providing opportunities for upskilling and collaboration.